The territory occupied by the Embassy is own by the represented country. Its mission will be to promote the interests of his country in the host nation, promoting friendly relations in between the two countries, promote economic, cultural, scientific, etc, creating state visits, both commercial and political treaties, among many other functions. If you look beneath you will see the Consulates in Los Angeles and nearby towns that exist in our database diplomatic missions worldwide. Contact the diplomatic staff of the various Embassies and Consulates in Los Angeles and surroundings for any administrative or urgent matter you will need. Even in case of conflicts, wars, inviolability of diplomatic premises is respected. The diplomatic legations enjoy a special status: they are inviolable. The security forces of a country can't enter a room enjoying diplomatic protection under any circumstances. The Consulates are responsible for processing visas and permits for persons wishing to visit their country and provide assistance and financial help to needy compatriots or other emergency. The administrative procedures that can be performed in a consular office vary between countries, so we advise that you contact the Embassies and Consulates in Los Angeles and around before going to do any management. Access to this section for a detailed listing of all Chinese consulates, embassies and representative offices situated near Los Angeles. ConsulBy offers all Indian citizens with an updated and verified list of all Indian consular offices so they are able to contact them with any unexpected situation while in Los Angeles and its surroundings. Have a look making use of this link a collection of all Nigerian embassies and consular offices placed around Los Angeles, just in case you need assistance when you're abroad. Check the Russian diplomatic mission in Los Angeles, responsible for providing assistance and support to any Russian person while they are visiting the country. Access to this section for a detailed listing of all German consulates, embassies and representative offices located near Los Angeles. ConsulBy offers all French citizens with an updated and verified list of all French consular offices so they can contact them with any unexpected situation though in Los Angeles and its surroundings. 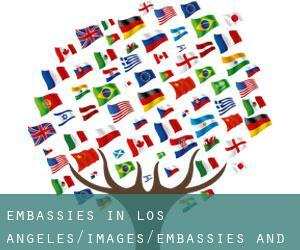 Have a look using this link a collection of all British embassies and consular offices placed around Los Angeles, just in case you need assistance though you're abroad. Check the Spanish diplomatic mission in Los Angeles, responsible for providing assistance and help to any Spanish person whilst they're visiting the country.